Copper Country Hockey History ! The Copper Country, in Michigan's Western Upper Peninsula, is considered the Birthplace of Organized Professional Ice Hockey and Home of the World's First All Professional Ice Hockey Team! This web site is dedicated to the First All Pro Hockey Teams who formed the World's First Professional Hockey League in 1904.
the Hockey Museum in the Dee Stadium, please contact the webmaster. 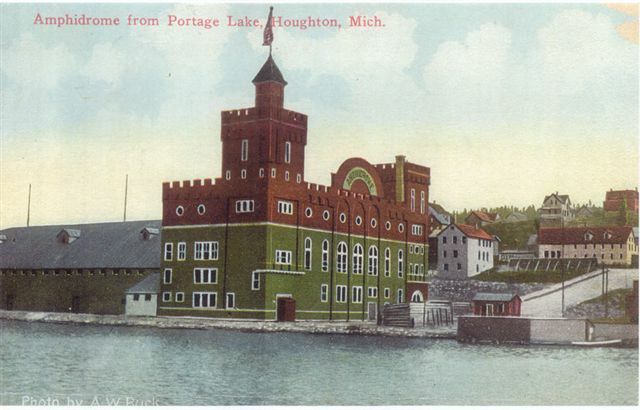 The Portage Lake Professional Ice Hockey Team started right here in the Copper Country in Michigan's Western Upper Peninsula in 1902. 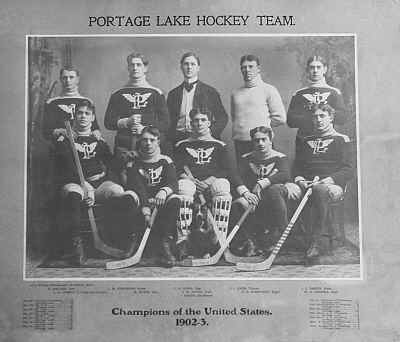 Then in 1904, the Portage Lakes organized the World's First Professional Ice Hockey Inter-City League, it was called the International Hockey League. Click here to see pictures of the local Hockey Museum in the "Dee"
Local hockey player legends 1898-present who played pro, semi-pro or college hockey after high school. Click here to see Championship Hockey Teams that were from the Copper Country! 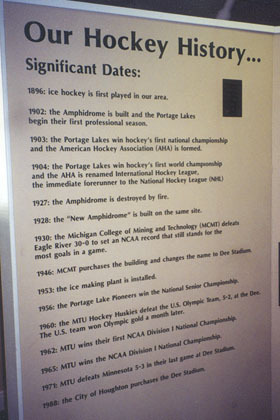 Home ice for the Portage Lake team since 1902 has been the Amphidrome; after a fire in 1927 it was rebuilt and called the New Amphidrome, it was renamed the James R. "Dee" Ice Stadium when Michigan Technological University acquired the building for their hockey team in 1943. James R. Dee, was a local business man, who coordinated the financing for the rebuilding of the ice rink after the 1927 fire in time for the next season. Dee has been known as the Father of American Hockey for organizing some of the first American hockey teams. The ice rink is located on the shore of Portage Lake in Houghton, Michigan. The stick measures 42 inches from top to heel, with a 10 inch blade and is made of one piece of wood. "HERN / GIBSON / H. STUART / MORRISON / B. STUART / R. WESTCOTT / SHIELDS / F. WESTCOTT / LINDER / DUGGAN // PORTAGE LAKE HOCKEY TEAM, CHAMPIONS OF AMERICA / AMPHIDROME. HOUGHTON MICH."
RILEY GIBBY HODDY BERTIE ERNIE COONEY FREDIE JOEY JIMMY WEBBY PATTY / CHAMPIONS OF AMERICA 1903-4 / COLORS - GREEN and WHITE / WESTCOTT"
This area, located in the Western part of Michigan's Upper Peninsula, is known as the "Copper Country" from its early Copper mining days. By car, we are 6 hours from Chicago, 7 hours from Minneapolis, and 9 hours from Detroit and 4 hours NE of Duluth. Michigan Tech University is located here in Houghton, click here for details on how to get here. The Copper Country, in Michigan's Western Upper Peninsula, is considered the Birthplace of Organized Professional Hockey and Home of the World's First Professional Hockey Team! Copper Country Junior Hockey (CCJHA) is for boys and girls ages 5 to 17 years old (girls teams to age 19). There are over 300 players in CCJHA programs including Developing Mites, Mites, Squirts, PeeWee, Bantam, Midget and two all girls teams. Travel teams are formed along with C-L-K in the Midgets, Bantam, PeeWee, Squirt, Mites and Girls divisions. CCJHA uses two publicly owned ice rinks: the Houghton County Ice Arena in Hancock and the Dee Stadium Ice Rink in Houghton. Both rinks are enclosed, have team locker rooms with showers, concession stands and artificial ice. 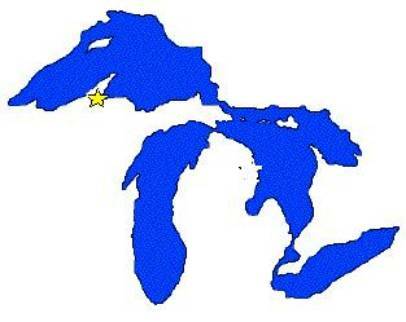 Calumet-Laurium-Keweenaw C-L-K Junior Hockey is for boys and girls ages 5 to 17 years old.. There are over 300 players in C-L-K programs including Developing Mites, Mites, Squirts, PeeWee, Bantam, and Midgets. Travel teams are formed along with the CCJHA in the Midgets, Bantam, PeeWee, Squirt, Mites divisions. C-L-K uses two publicly owned ice rinks: the Calumet Armory in Calumet and the Bi-Centennial in Laurium. Both rinks are enclosed, have team locker rooms with showers, concession stands and artificial ice. There is a Midget AAA Hockey Team called the Ojibwa Eagles with home ice at the Michigan Tech University Student Ice Arena. They were originally sponsored by the Keweenaw Bay Indian Community and the Ojibwa Casino. Their official webpage is here, Ojibwa Eagles. There are three local College Hockey Teams: Michigan Tech University Hockey team plays in NCAA Division I; their home ice is the John MacInnes Student Ice Arena. The Finlandia University Men's Hockey team plays in NCAA Division III; their home ice is the Houghton County Ice Arena in Hancock. The Finlandia University Women's Hockey team plays in the NCHA; their home ice is the Houghton County Arena in Hancock. Michigan Tech also has a traveling Club Team called the Wolf Pack that competes in the Western Collegiate Club Hockey Association WCCHA made up of 5 collegiate club teams, which are part of the American Collegiate Hockey Association ACHA. Michigan Tech also has an extensive intramural hockey league for college students in the winter and for teen players in a summer hockey league as well as Hockey Development Youth Camps all summer. There are four all girl hockey teams locally: the Michigan Tech University Girls Hockey Club; their home ice is the John MacInnes Student Ice Arena, the Finlandia University Women's Hockey team plays in the NCHA Division; their home ice is the Houghton County Arena in Hancock; and the Keweenaw Wings Girls Hockey team U19 and the K-Wing Girls Hockey team U15, and in years past, the Calumet Women's Team. There are two Adult Hockey Teams that play here: the Portage Lake Pioneers; their home ice is at the Dee Ice Arena, and the Calumet Wolverines; their home ice is at the Calumet Armory, the Pioneers and the Wolverines both compete regionally and nationally at the Adult Level. There are also many inter-league Adult teams who compete locally year around. There have been many local teams who won Upper Peninsula and Regional Championship Titles. There have been many local teams who won State and National Championship Titles. The History of Gibson Cup starts here in the Copper Country, and the Teams who Won the Cup are listed here. The History of the MacNaughton Cup starts here in the Copper Country, and the Teams who Won the Cup are listed here. If you have pictures of local teams, please contact the webmaster, we would love to include them on this web site!